My head unit has 3 preouts, 2 normal and 1 sub. I have connected my 2 normal to a 4 channel amp, but i am wondering do i connect the sub output direct to my mono amp? 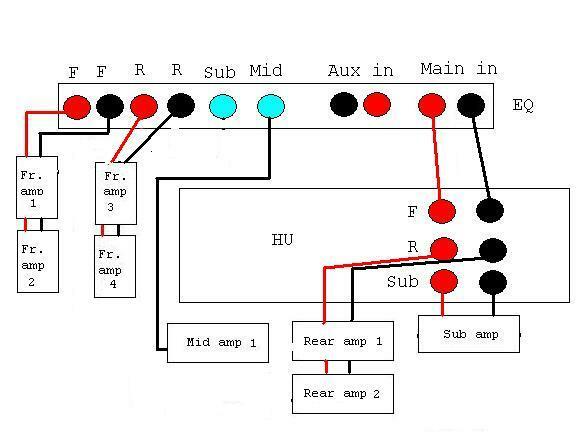 The sub output has 2 aux (left and right)and the amp has 2 inputs (left and right), i was told by a friend that i only do this if i am going to bridge the amp, if not i only connect one of them, is this correct? The amp has 2 speaker connects which i was going to connect 1 sub to each connection. Have rca's into both inputs. won't hurt it any. What kind of amp do you have, and are your subs dual 2, dual 4, single 4, single 2 ohm? Connecting more then 1 rca is fine. ^^That is a lot of amps. what hu and what amp model #s.
"The sub output has 2 aux (left and right)and the amp has 2 inputs (left and right), "
Aux are usually for external stuff in like a dvd, Playstation, mp3 player in.